Looks like I and many others were wrong. 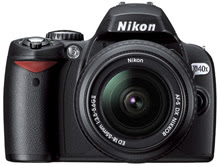 It doesn't look likely sooner than March now for a Nikon D3. I have a negative bias towards the D40 itself. This camera represents another nail in the death of Nikons backwards compatibility. Not only does this camera not meter with pre-AF lenses (as has been the norm for Nikons lower end bodies for some time now), it also doesn't Auto Focus with pre AF-S lenses (screw drive AF doesn't work). The feeling of "screwing the customer" continues with the D40x. Sure, this model doesn't replace the D40. It's more expensive and will be sold along it. They should have called it something else. Every D40 owner I know is pissed (even though they know it costs more). If you plan to buy the 18-200mm VR Nikkor and attach it to this camera, go ahead. If you're interested in photography as an art, please buy any other Nikon except for this one, one that can AF with classic Nikon AF Lenses.